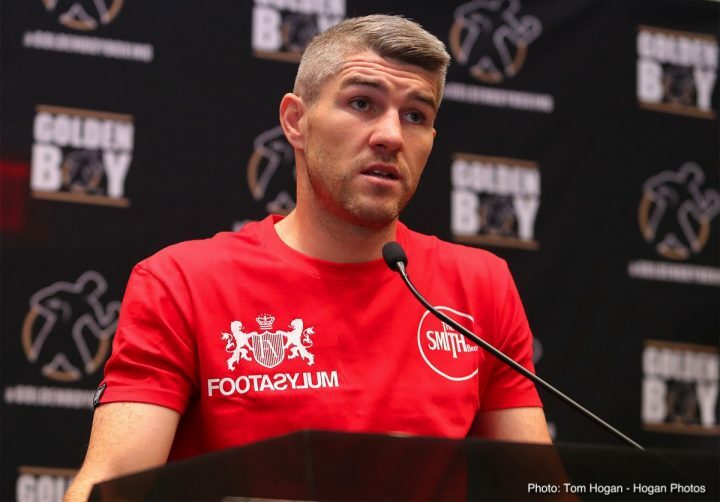 By Trevor McIntyre: Former WBO junior middleweight champion Liam ‘Beefy’ Smith (26-2-1, 14 KOs) will be facing former British and European welterweight champion Sam Eggington (23-5, 15 KOs) on DAZN in the US and Sky Sports on March 30 at the Echo Arena in Liverpool, England. This will be the first fight of Smith’s three-fight contract with Matchroom Boxing promoter Eddie Hearn. In terms of pure entertainment, Smith vs. Eggington is a good fight. However, on paper, it certainly looks bad for Smith that Hearn is dropping him down a couple of levels in matching him against Eggington, a domestic level fighter, following his disappointing loss to Jaime Munguia last July. That’s a demotion of sorts for Smith as far as his opponent. Smith was very competitive with Munguia. It wasn’t a complete wipe-out like smoe boxing fans expected it would be. Smith never gave up against Munguia, and he landed a lot of good shots. However, Munguia’s punching power made it difficult for Smith to win rounds, because the judges were impressed with the Mexican fighter’s harder landing shots. For Smith to go from that fight facing a guy like Eggington, it’s a definitely a big step down for him. If Smith loses to Eggington, it might be time for him to consider retiring from boxing. You can’t rule out a loss for Smith. He took a lot of punishment in his loss to Jaime Munguia in his last fight, and he’s facing a younger fighter in 25-year-old Eggington, who can punch and he throws a lot of shots. Smith doesn’t have a great engine. That’s his biggest flaw, and he doesn’t like getting hit to the body. Eggington hits hard and he’s an excellent body puncher. If Eggington follows the blueprint created by Saul Canelo Alvarez in how to beat Smith, he could wear him down with volume punching and body shots to pull off an upset. Smith will likely continue his career after a loss to Eggington, but it wouldn’t be pretty. Hearn would have to find a different course for Smith. Putting Smith in with Kell Brook at that point would be totally out of the question. Hearn would be laughed at and ridiculed by boxing fans if he made a Brook-Smith fight with Liam coming off of a loss to Eggington. Hearn is in the business of entertaining his boxing fans at home in the UK, so he has to make fights like Smith vs. Eggington unfortunately. Hopefully for Liam’s sake, he doesn’t end up fighting domestic level opposition for the full three fights of his three-fight contract with Matchroom Sport. Surely, Hearn didn’t ink Smith just so that he could match him against guys like Eggington over and over again. It would be a waste of money on Hearn’s part. Smith is clearly being saved for a fight against Kell Brook for 2019 or 2020. Hearn says he’s going to have Smith fighting for a world title in 2019 at junior middleweight, which is kind of interesting. Smith has already lost to World Boxing Organization 154 lb champion Jaime Munguia. It would look silly on Hearn’s part to put Smith back in with Munuguia for a second fight. That leaves only IBF/WBA champion Jarrett Hurd and WBC champion Tony Harrison as possible options for Smith. Harrison has already said he wants a fight in the UK against Brook, but that’s obviously not an option with Hearn seemingly protecting Kell matching him softly while he waits for the smoke to clear from the Terence Crawford vs. Amir Khan fight. Harrison has a rematch that he needs to take care of first against former WBC 154 lb champion Jermell Charlo, who he beat by a controversial 12 round unanimous decision on December 22. The Harrison vs. Charlo rematch likely won’t take place until April. So there’s a possibility that Smith could be fighting the winner of the Harrison vs. Charlo rematch later in 2019. It’s a bad match-up either way for Smith, but what else can Hearn do with him, aside from putting him in with Eggington and Brook? While some boxing fans might complain about Smith being matched against a non-world class fighter in 25-year-old Eggington, this is pretty much the level of most of the fighters that Smith has faced during his career. If you look closely at Smith’s 11-year resume, he’s fought domestic level opposition throughout his career. The only times Smith has strayed from that course is when he fought Saul Canelo Alvarez and Jaime Munguia, both of which easily beat him. All Hearn is doing in matching Smith against Eggington is putting him in with the type of opponent that he’s been facing most of his career. Hearn obviously knows Smith’s level. Smith has mostly been facing domestic level opposition during his career unfortunately. It was originally believed that Smith, 30, was signed so that Hearn could immediately match him against Kell Brook, who needs to be put in with better opposition after taking two soft fights while waiting for his mega-clash against Amir ‘King’ Khan. But it looks like Hearn has found another relatively safe fight for Brook in Jessie Vargas for a match that is negotiated for April 6. Liam Smith would be a tougher fight for Brook than Vargas, most boxing fans would agree. Hearn isn’t going to take any chances of Brook getting beat by putting him in with someone a little too good like Liam, even though it’s a fight that Kell would likely win. It wouldn’t be easy though. Smith would let Brook know that he was in a fight. It’s not that Brook wouldn’t beat Smith. It’s just there would be the potential of another eye injury for Brook due to Smith’s heavy hands. The sparring that Smith and Brook had several years ago showed that Kell had problems with his size and punching power. Eggington’s career has been on the downside as of late. He was stopped in the 2nd round by Hassan Mwakinyo last September. That was a bit of a surprise, because a lot of boxing fans expected Eggington to win that fight, but he was totally over-matched by the hard punching Mwakinyo in that fight. In 2017, Eggington was beaten by Mohamed Mimoune by a 12 round split decision in losing his European Boxing Union welterweight title. That was obviously a disappointment for Eggington, but there was nothing he could do about it. Mimoune had too much skills for him, and he was able to take advantage of Eggington’s nonexistent defense. Eggington was beaten by Bradley Skeete by a 12 round unanimous decision in 2016. After that fight, Eggington looked good in putting together a nice run of four fights. He looked good against the level of opposition that he was fed during that run.